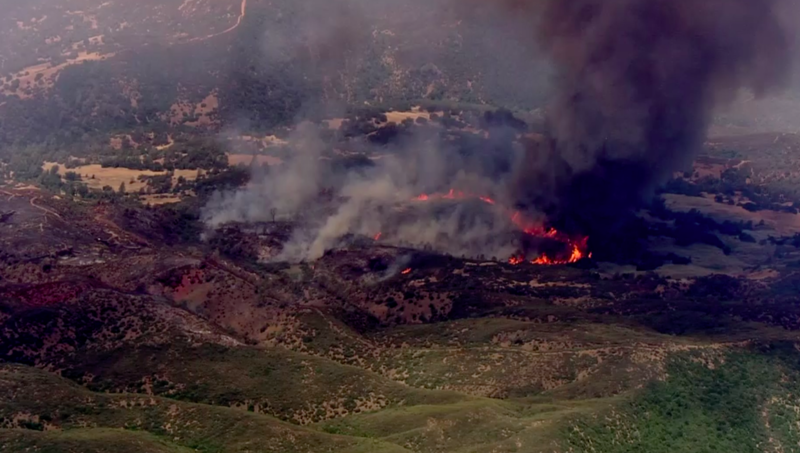 The Pawnee Fire in Lake County, California has rapidly outpaced efforts to combat it, according to CBS San Francisco. The inferno spread rapidly Sunday to 7,700 acres and razing at least a dozen structures. Cal Fire said the blaze was "out of control" and the threat to homes in the Spring Valley are was "imminent." At 5 p.m. PT, the blaze had grown to 3,000 acres and was threatening 600 structures as it burned through the area of steep, rugged terrain. "We have a mandatory evacuation of Spring Valley," Cal Fire Division Chief Gary Bertelli said early Sunday. "It's imperative that they evacuate." Bertelli said of the structures destroyed by daybreak, 10 were homes and two were outbuildings. Accelerated spreading of the flames has been attributed to extremely high temperatures, low humidity and whipping winds. Resources dispatched to the disaster include firefighters on the ground, bulldozers and air tankers. The Pawnee Fire began at around 5:21 p.m. Saturday near Pawnee Rd & New Long Valley Rd, northeast of Clear Lake Oaks. Soaring temperatures, single digit humidity and gusty winds have prevented firefighters from holding the blaze away from the homes in Spring Valley. Overnight, the fire jumped New Long Valley Road. More than 230 firefighters, air tankers and bulldozers were called in to battle the blaze. Mutual aid was also rolling in from the Bay Area. Thomas Leavy contributed to this report.